The territory in question from the 1837 Treaty of St. Peters. Usufructuary rights: The right to use the property owned by another without altering it. When discussing who owns Minnesota, no issue stands out more than that of treaties between the U.S. government and Indian tribes, and in recent years no case has reshaped our understanding of ownership more than the 1990s court case concerning the 1837 treaty between the federal government and the Chippewa Indians of east central Minnesota. The case changed not so much actual ownership but the nature of ownership and control over millions of acres of land, including Lake Mille Lacs and the important walleye fishing rights and regulations there. In the following piece, Prof. Roderick Squires, Ph.D., University of Minnesota, outlines the process behind this case, from initial filing to the Supreme Court decision that made it a precedent for other treaty rights cases across the nation, changing the definition of ownership for landowners and Native Americans alike. Virtually every treaty made between the United States government and American Indian bands has been litigated in the federal courts. At issue in many cases was the meaning of specific language in a particular treaty. The U.S. Supreme Court has stated that the plain meaning of the treaty language cannot be ignored, but staying mindful of the bargaining inequities between the two parties, it has developed canons or rules of construction when deciding meaning in treaties. Treaties are to be construed as the American Indians would have understood them; any ambiguities concerning meaning should be resolved in favor of the American Indians; and clear Congressional intent is necessary to repeal American Indian treaty rights. Such directives mean that litigation involving treaty language requires federal courts to decide on an appropriate history of the parties before and after the treaty-making episode, often based upon the testimony of non-legal scholars, to infer what the American Indian signatories understood to be the provisions of the treaty. It is customary to pay more attention to appellate court rulings that are legally more important than the rulings of the trial or district court. However, the appellate courts are generally concerned about issues with procedure rather than with fact; all of the facts and many of the arguments articulated in their rulings are first introduced at the district court level. While the appellate courts summarize what they regarded as the appropriate history before delivering its opinion, the history is usually not as exhaustive as the one provided by the trial court, the focus of this brief article. In August 1990, the Mille Lacs Band of Chippewa Indians filed suit against the state of Minnesota in federal district court, asserting that specific language in a treaty signed in 1837 between the United States government and several American Indian bands, including the Mille Lacs Band, gave its members usufructuary rights to hunt, fish, and gather on the land ceded in the treaty, rights that the state could not regulate.Four years later, Federal District Court Judge Diana Murphy agreed with the Band. Almost three years later, in January 1997, Federal District Court Judge Michael Davis ruled how the Band could exercise those rights. Later that year, the Eighth Circuit Court of Appeals affirmed the ruling. And in March 1999, the United States Supreme Court, in a 5-4 decision authored by Justice Sandra Day O’Connor, upheld the Eighth Circuit Court ruling. Affirming the district courts’ ruling, the appellate courts acquiesced to the district court’s interpretation of history and hence the meaning of the language used in the 1837 treaty and the manner in which the Band and its members could exercise their usufructuary rights. All the courts held that the treaty separated those usufructuary rights from the rights possessed by those holding formal title to the land. The Court of Appeals held that the Chippewa retained their usufructuary rights under the 1837 Treaty with respect to land located in the State of Minnesota. This conclusion is consistent with the Seventh Circuit Court of Appeals’ earlier decision holding that the Chippewa retained those same rights with respect to the ceded land located in Wisconsin. The privilege of hunting, fishing, and gathering the wild rice, upon the lands, the rivers and the lakes included in the territory ceded, is guarantied (sic) to the Indians, during the pleasure of the President of the United States. In March 1991, the parties agreed that the case should be separated into two. In Phase I the court would determine whether the 1837 rights still existed, the nature of the rights, and where they could be exercised. If necessary, Phase II would examine how Band members could exercise those rights and how the state could regulate that exercise. Three other parties joined the lawsuit. Nine counties now in the area ceded in 1837 and four landowners owning property in the ceded area asked to join on the side of the State. The Eighth Circuit Court allowed both to join the suit as defendant-intervenors. The United States was allowed to join the Band as a plaintiff-intervenor. Two years into the lawsuit, the two sides attempted to settle the dispute through legislative action. The State and the Band had reached a compromise and even drafted a settlement agreement. However, the bill introduced in the 1993 Legislative session to ratify the agreement was not passed and the lawsuit continued. The Band had asked the court to rule in its favor without a trial, but on May 13, 1994, Federal District Judge Diana Murphy ruled that a trial would be held. During the trial, held June 13-July 6, fourteen witnesses testified and more than 400 exhibits were submitted. The bulk of the evidence was presented by eleven expert witnesses who provided most of their testimony in the form of written reports. Before the trial, the written reports were examined in depositions and each expert was questioned about what he or she wrote. The reports, and the responses each individual provided to the questions posed by the attorneys during the depositions, were examined again in the trial. (T)he Chippewa did not consent to removal in the 1837 treaty and that the Chippewa did not understand that the treaty gave the President unfettered discretion to extinguish their privilege. (T)he 1850 executive order was suspended and that it never applied to the Mille Lacs Band. The revocation of hunting, fishing, and gathering rights was never enforced against any of the Chippewa. The record indicates that the executive branch intended to repeal the 1850 executive order. There is no evidence that the Chippewa understood that the usufructuary privilege would be terminated whenever land was surveyed and sold. Although the patent process did not extinguish the privilege, exercise of the 1837 usufructuary rights should be limited to lands in the ceded territory that are not privately owned because no right of access was included in the privilege. The privilege granted in 1837 was not limited to use of any particular techniques, methods, devices, or gear. The State may not impose its own regulations if the Band can effectively self-regulate and if tribal regulations are adequate to meet conservation, public health, and public safety needs. Phase II concluded on January 29, 1997, without a trial, when District Court Judge Michael Davis issued summary judgment for the bands, ruling that the usufructuary rights in the ceded area were to be regulated by the bands’ conservation code rather than by the state’s fish and game rules. In documents submitted to the court, the Band and the United States had identified state law they believed inappropriately regulated how, where, and when Band members could exercise their treaty rights in the ceded area. They also proposed a conservation code to regulate their hunting, fishing, and gathering activities. The State similarly identified state law it believed applicable to regulate the Band members’ hunting, fishing, and gathering activities and pointed to concerns over the Band’s proposed conservation code. At this point several other Chippewa bands whose ancestors had been signatories to the 1837 treaty were allowed to join the Mille Lacs Band and the United States in the suit. The State and the Bands shall fairly, uniformly and diligently enforce the conforming Band conservation codes adopted pursuant to this Court’s final order, and their respective enforcement officers shall work cooperatively in doing so. In their respective enforcement activities, the Minnesota Department of Natural Resources shall make good faith efforts to coordinate with Band conservation wardens and Great Lakes Indian Fish and Wildlife Commission wardens duly appointed by a Band, and the Bands shall make good faith efforts to coordinate with State Department of Natural Resources Conservation Officers. The Bands and Great Lakes Indian Fish and Wildlife Commission Enforcement and Biological staffs shall share harvest, registration and similar data with the Minnesota Department of Natural Resources enforcement and biological personnel in a timely and professional manner…. In March 1997, the state of Minnesota filed an appeal with the Eighth U.S. Circuit Court of Appeals, which in August of that year upheld the lower court’s decisions. Three months later, the full Eighth U.S. Circuit Court of Appeals denied a request to reconsider the ruling of the three-judge panel. The State appealed the Eighth Circuit’s decision to the United States Supreme Court, which, despite an opposition brief filed by the United States, agreed to hear an appeal. Before oral arguments were held both plaintiffs and respondents submitted briefs summarizing the facts of the case, the legal issues to be decided, the law the Court ought to apply, and the decision the Court should reach. In addition, other parties filed briefs, called amicus curiae, in support of either party. On December 2, 1998, the U.S. Supreme Court heard arguments from the counsel for the state, concerned landowners, the Band, and the federal government. Four months later, the Court published its opinion. In a 5-4 decision, authored by Justice O’Connor, the Court affirmed the Eighth Circuit’s ruling that the Mille Lacs Band continued to possess the usufructuary rights that were guaranteed to them in the 1837 treaty. In addition to maintaining that neither the 1850 executive order nor 1855 treaty terminated the Mille Lacs Band’s usufructuary rights, the ruling also held that the Mille Lacs Band’s usufructuary rights were not extinguished when Minnesota was admitted to the Union. The case still resonates in Minnesota, in part because it now makes it necessary for the state and the Mille Lacs Band to agree on how best to manage the Mille Lacs fishing resources. District Court Judge Davis’ ruling also means that disagreements between the state and the band would be adjudicated by the court. Since the district court’s interpretation of treaty language was upheld by the Supreme Court, this case became a precedent that is cited in other cases where the issue is treaty language or usufructuary rights defining aboriginal title. The case has also been used to assert broader American Indian rights. It was used recently by the White Earth Band of Chippewa in a Certificate of Need hearing before the Minnesota Public Utilities Commission. Virtually all treaties have been the subject of litigation. Some of the litigation focuses on the nature of the implied sovereignty of American Indians in a particular treaty, some on the nature of the rights ceded in a particular treaty or the corollary, the nature of the rights that were not ceded, and some on the adequacy of compensation for the rights that were ceded. Perhaps litigation over treaties is inevitable, because there is no equivalent to aboriginal title in Anglo-American law. Originally designed to extinguish aboriginal title, treaties continue to be a source of controversy. — Roderick Squires is an associate professor in the Department of Geography at the University of Minnesota. He specializes in public policy, landscape in society, and public land history. The rulings or opinions from the Eighth Circuit are binding on all courts within its jurisdiction and the Supreme Court opinions are binding on all courts in the United States. The treaty was negotiated and signed at St. Peters, Wisconsin Territory (present-day Mendota, MN) on July 29, 1837 (7 Stat. 536) and proclaimed by President Martin Van Buren June 15, 1838, online at http://digital.library.okstate.edu/kappler/Vol2/treaties/chi0491.htm accessed May 12, 2014. Judge Murphy’s decision can be found at 861 F. Supp. 784 online at http://law.justia.com/cases/federal/district-courts/FSupp/861/784/2261846/ accessed May 12, 2014. Judge Davis’ decision can be found at 952 F. Supp. 1362 online at http://law.justia.com/cases/federal/district-courts/FSupp/952/1362/1432262/ accessed May 12, 2014. The Eight Circuit decision can be found at 124 F.3d 904 online at https://law.resource.org/pub/us/case/reporter/F3/124/124.F3d.904.97-1774.97-1937.97-1938.97-1772.97-1771.html accessed July 15, 2014. Justice O’Connor announced the Supreme Court’s publication online at http://www.oyez.org/cases/1990-1999/1998/1998_97_1337accessed April 28, 2014. The complete opinion of the Court, in which Justice O’Connor was supported by justices Stevens, Souter, Ginsberg, and Breyer, can be found in 526 U.S. 172 (1999)online at http://www.law.cornell.edu/supct/pdf/97-1337P.ZOaccessed April 28, 2014. Chief Justice Rehnquist, joined by justices Scalia and Kennedy, wrote one dissent online at http://www.law.cornell.edu/supct/pdf/97-1337P.ZD accessed April 28, 2014. Justice Thomas wrote a separate second dissenting opinion online at http://www.law.cornell.edu/supct/pdf/97-1337P.ZD1 accessed April 28, 2014. The district court evaluated the histories that were constructed in the testimony of expert witnesses, the arguments that were constructed by the attorneys for the parties based on that testimony, and on the previously published opinions of other courts in cases involving similar histories and arguments. 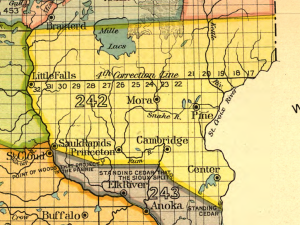 The off-reservation hunting, fishing, and gathering rights of the Chippewa people were recognized in 1983 after years of litigation in Lac Courte Oreilles v. Voigt, 700 F.2d 341 (7th Cir. 1983) online at http://www.leagle.com/decision/19831041700F2d341_1991.xml/LAC%20COURTE%20OREILLES%20BAND,%20ETC.%20v.%20VOIGT A synopsis of this case can be found in Ronald N. Satz. Chippewa Treaty Rights. The Reserved Rights of Wisconsin’s Indians in Historic Perspective (Madison, WI. Wisconsin Academy of Sciences, Arts and Letters, 1991) Chapter 7 The Continuing Pursuit of Justice. online at http://images.library.wisc.edu/WI/EFacs/transactions/WT199101/reference/wi.wt199101.i0016.pdf. The counties were; Aitkin, Benton, Crow Wing, Isanti, Kanabec, Mille Lacs, Morrison, Pine, and Sherburne. Mille Lacs Band v. State of Minnesota et al. 989 F.2d 994 online at http://openjurist.org/989/f2d/994/mille-lacs-band-of-chippewa-indians accessed May 16, 2014. “Settlement Agreement between the Mille Lacs Band of Chippewa Indiana and the State of Minnesota regarding Treaty Hunting, Fishing and Gathering Rights.” Online at http://www.leg.state.mn.us/webcontent/lrl/issues/indian/dnrsettlement.pdf accessed April 28, 2014. 853 F. Supp. 1118 online at http://law.justia.com/cases/federal/district-courts/FSupp/853/1118/1517666/ accessed May 14, 2014. Supra note 4 at 790-791. 48 F.3d 373 online at https://law.resource.org/pub/us/case/reporter/F3/048/48.F3d.373.94-3943.94-3618.94-3566.html accessed May 14, 2014. Id. The bands all resided in Wisconsin and had been involved in the lawsuit Lac Courte Oreilles v. Voigt cited in note 10 above. The bands were St. Croix Chippewa Indians of Wisconsin, Lac du Flambeau Band of Lake Superior Chippewas, Bad River Band of Lake Superior Chippewa Indians, Lac Courte Oreilles Band of Lake Superior Chippewa Indians of Wisconsin, Sokaogan Chippewa Community, and Red Cliff Band of Lake Superior Chippewa. Mille Lacs Band Statutes Annotated (2004) title 11 chapter 5. 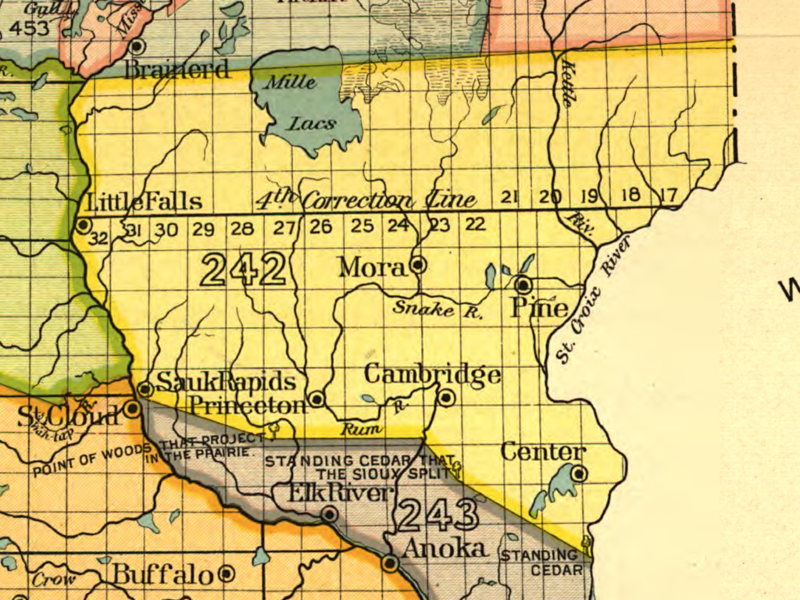 1837 Treaty Conservation Code for the Minnesota Ceded Territory online at http://www.millelacsband.com/pdf/StatutesTitle11.pdf 527-565 accessed May 15, 2014. The Supreme Court granted certiorari on June 8, 1998 524 U.S. 915. See Brief for the United States in opposition online at http://www.geog.umn.edu/faculty/squires/research/American_Indians/mille_lacs.html#11 accessed April 28, 2014. The oral arguments can be heard at http://www.oyez.org/cases/1990-1999/1998/1998_97_1337 accessed April 28, 2014. This argument was never addressed in the district court’s opinion but was raised in the appeal to the Eighth Circuit. See Resources on Minnesota Issues. Indian Fishing and Hunting Rights. Online at http://www.leg.state.mn.us/lrl/issues/issues.aspx?issue=indian. Accessed April 28, 2014. The current “Treaty Fishery Management Plan for the 1837 Minnesota Ceded Territory for the Years 2013-2017,” May 2012. Online at http://www.outdoornews.com/fisheries%20management%20plan%202013-2017%20%20Draft.pdf. Accessed May 15, 2014. The Supreme Court decision has been cited in 125 court cases and 272 law review articles. Erlinder, Peter. “Minnesota v. the Mille Lacs Band of Chippewa Indians: 19th Century Treaty-Created Usufructuary Property Interests, the Foundation for 21st Century Indigenous Sovereignty.” William Mitchell College of Law Legal Studies Research Paper series, Working Papers No. 2013-2014. Online at http://d3n8a8pro7vhmx.cloudfront.net/honorearth/pages/306/attachments/original/1397915882/Exhibit_C_-_Mille_Lacs_article_2014-03-11_PE_on_Chippewa_Treaty_rights.pdf?1397915882. Accessed May 15, 2014.